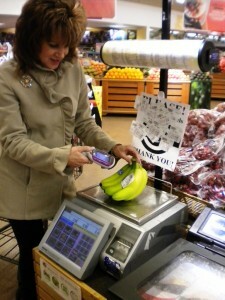 At the Supermarket, Use the “Scan It!” and be Done With it! You are here: Home / Columnists / John Guy LaPlante / At the Supermarket, Use the “Scan It!” and be Done With it! First: At the Scan It rack, shopper Debra Mals scans her Stop & Shop card, then picks up a Scan It device from one of the nests. If you have the chore of doing the shopping at the supermarket, use a Scan It! A Scan It! will save you time. Give you more control over your spending. And speed you out a lot faster, not even having to deal with a clerk. The Scan It! is the latest digital device that I’ve come across. As we know, there’s been a frenetic roll-out of electronic devices–escalating every year and changing our lives in remarkable ways. I’m delighted to have discovered the Scan It! It’s already changing the way I shop. Of all the digital marvels I’ve mentioned, the Scan It is unusual in an interesting way. You don’t buy it or lease it. You borrow it. And only for when you’re really shopping in the store that makes them available. And it has another distinctive feature. Its purpose is not only to make your life easier. It’s to make that store more profitable. Yes, the Scan It will help you in several ways. But it will let that store make more money by ushering you through your buying spree faster and without needing a clerk at checkout. The store will reduce its payroll. You can breeze into the store, pick up a Scan It, cruise the aisles and pick up everything you need, then check out at a self-service register. You’ll get it all done and walk out without talking or interacting in any way with another person. Except maybe a clerk in deli or the fish or meat departments if you want something special. I came across the Scan It at the Stop & Shop in Old Saybrook. I buy at three or four supermarkets in the area–wherever I happen to be when I need to pick up a few things. To my knowledge, Stop & Shop is the only one that has adopted the Scan It. And they have it only in select stores. I know I’ve got you wondering, What the heck is the Scan It? Let me tell you. It looks like an odd-shaped cell phone, but bigger. It is hand held, easy to use, not heavy, and you use it for every item you want. But the item must have a barcode. Stop & Shop has a display of Scan Its right by its two front doors. Two racks of 24 of them, each in its own nest. Each one has the word Motorola on it, by the way. They are silently charging, awaiting you. You take one and use it as you wander through. And you leave it behind when you check out. You can put it back. If you don’t, the store will do it, and the Scan It will immediately pep itself up for the next borrower. No charge of any kind for you to use it. I was standing there studying one of the racks. Had never noticed it. I had seen a gal using a Scan It on a previous visit and I became fascinated. Now, all the other shoppers were just walking by, ignoring the devices, or not being aware despite Shop & Shop efforts to promote it. All 24 were there idling, so to speak, not getting the attention they deserve. Then Debra Mals strode in and picked one up. Right next to me. She did it so fast and so naturally that I was sure she was a Scan It expert. My big opportunity! Maybe I could entice her to become my personal Scan It tutor. And I succeeded. It took me only two minutes to explain that she could help countless folks around here who know zilch about the Scan It. How? Just by letting me walk around with her, see how she uses it, take a few pictures at key moments, and let me write this report for you. What a good sport this Debra! An interesting gal. She is a dance instructor in the Old Saybrook Park and Recreation program. Lives in Old Saybrook with her husband Peter and their college-age daughter. Debra does all the shopping and does it all in just a single visit per week. She comes in with a shopping list, not on paper but in her brain, and, I found out, gets the job finished with supreme efficiency. Then out she goes, all done for another week. I asked her one question after another. She was suspicious at first. Of course. Who wouldn’t be? Then she smiled. “Sure,” she told me. “More people should know about the Scan It.” And we started out. Before long, I could see she was enjoying our Scan It ramble as much as I was. Here are the basic steps she went through as we walked along. The Scan It rack has a scanner dead center at chest level. She swiped her Stop & Shop member card into it. That’s all she had to do. The Scan It computer now knew her. Then she picked up a Scan It and we started down an aisle. She kept the Scan It in hand as she guided her cart. The cart was as big as they come. “I usually fill it!” she said. 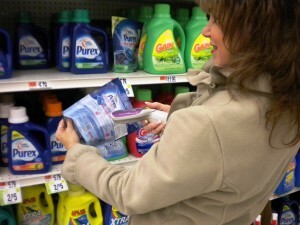 Second step: She selected an item, shot its barcode with the Scan It, then put the item in her basket. The Scan It kept full details. She knew the store cold. She stopped in the detergent department. She found the kind she wanted. She held the Scan It as she would a pistol, and scanned the item’s barcode by clicking a button. And put the item in the basket. Actually, in a heavy fabric bag. She had brought several. And that’s all she had to, in aisle after aisle. The name of the item was not important. It’s its barcode that was all-important. For custom orders, fresh seafood for instance, the clerk puts a printout with a barcode onto the purchase. And that’s how she proceeded through the whole store. She went at it fast and smoothly and her purchases piled up in her cart. What will she do when she gets to produce, I wondered. Bananas, say. Or grapes. Third step: For loose produce, she weighed it. The scale spit out a receipt with a barcode. She shot it with the Scan It. Then she showed me the trick. She carried the bananas to one of the digital scales. Put the bananas on it. Quickly tapped in the data the scale needed: she clicked Fruits, then Tropical, then Bananas, then Print It. The scale spit out a receipt. The receipt gave the price per pound and the weight and the total price. And it had a barcode. She just scanned the barcode and that was it! Now came the dramatic finale. She pushed the cart to one of the self-service checkouts. Each one has a Scan It “target”. She aimed her Scan It at it and shot it. I asked her why. the big monitor. She could see the total price and whatever tax was required. But this was no surprise: she had already seen that on her Scan It. She tapped “Okay.” Then she told me, “Now I can pay with cash, or a credit card, or a debit card.” She used a credit card. Now I saw why she had brought in her own bags. She said, “This way at the end I don’t have to bag everything in their plastic bags. Besides, better for the environment!” She smiled and gave me a wave, and pushed her cart out the door. She had saved a lot of time. Excuse me. She would have if she hadn’t had to explain everything to me. I’ve got to tell you I could not have found a better tutor! Debra had also explained a few other things as we worked our way through. “If I’ve put something in my cart and change my mind, all I have to do is take it out and then delete the item from the Scan It. Final step: At the register, she shot a “target.” This told the computer she was done. It showed her every item and the total cost. She paid with her card. Then out she went in jig time. “Let’s say I don’t want to spend more than $50. I keep putting things in my basket and checking the total. Finally the total is $49.75. Then I spot the pineapples. They’re on sale for $2.50. A good buy. I want one! But it will blow my budget. How do I handle this? I stayed behind. I wanted some grapes and half a gallon of milk. I picked up a Scan It and started out. Nothing to using it. Now I saw other interesting features. On sale items, the device showed me the saving every time. I pushed another button and the device showed me six items on special sale for Scan It customers only. One was a freebie: Muller Greek Corner yogurt with strawberries, 5.3 oz. I like yogurt. When I went for my milk, I picked up a container of it. Its price was $1.49. Who doesn’t like a freebie like that? I discovered one more advantage. Some purchases can be embarrassing when you go and face a live checkout clerk. I’m sure you can think of some such items. Using the Scan It avoids that. No clerk will get to see what you’re buying. It turns out that you can use your Ipad or Iphone or a device using Android to do the job. Another thought: maybe the Scan It means so much to Debra that she would refuse to spend her money in any store without the device. If that is so, the Scan It gives Stop & Shop a strong competitive edge. One thing I noticed on this whole experiment: I did not see any other customer using a Scan It. Remember, Stop & Shop has been offering the devices two years or more. How come such indifference? Is it because people are intimidated by the technology, which turns out to be so easy to use. I don’t know. Got to tell you that I’ll use the Scan It the next time I go in that store. As I look back, I think it’s one of the best things in the retail food industry since the invention of the grocery cart back in the 1940’s, which I remember. But I can look ahead, too. In 10 or 15 years, I see something else. No need for a Scan It. We’ll email our shopping list to our supermarket. If we’re not sure what we want, we’ll be able to examine each and every aisle of the store on our computer monitor. We’ll see every shelf close up, every item! We’ll type our selections on our keyboard and see how much they total! Then click “Send”! At the store, a humanoid robot will assemble our order and put it on a truck which will take it to our door. I know Stop & Shop offers this service already, but with humans, not humanoids. But the humanoids are coming! I won’t like shopping like that. I have other reasons to go to the big stores besides buying stuff. I like the exercise walking the aisles. And seeing people. So, so interesting. Speaking of that, I know some folks found it very interesting to watch Debra tutoring me!